Technoworries blog created to relay important information and help people solve minor computer repair issues themselves. If you are having trouble making out the words on your computer screen you can magnify things for an easy to see PC. I do this every day. Every day since I turned fortyish. Somewhere around forty I discovered that computer screen manufacturers must share tools with car mirror manufacturers. I know this because objects on the monitor are larger than they appear. They must be. Before you send messages suggesting that the issue is with my eyesight I have already acknowledged and discounted that possibility but thank you anyway. At management staff meetings when some smart aleck kid (barely thirty and the kid thinks he is so clever) would ask me if I needed him to hold the report since my arms weren’t quite long enough I didn’t take a swing at him. Instead, without blinking, I clearly restated my weekly request to have the office printer fixed as the machine continued to produce the occasional blurry document which seemed to have the uncanny knack of landing in front of me every Monday. Nobody argued the point. Sure a few people looked at me over their glasses with a raised eyebrow but what ever. It was right around that time that the desktop and laptop screens I own all started acting up as well. The icons shrunk, the letters got fuzzy, and I found myself squinting. Probably a power surge or computer virus they haven’t figured out yet. So rather than buy all new monitors I found a few ways to make things on the screen larger or more clear in the meantime. This also coincidentally turned out to be helpful to friends and customers whose vision has started to fade a bit. I hope that never happens to me. My personal favorite magnification method uses the scroll wheel of the mouse. The same effect can be had using the Control Key along with the + or – key. This is a temporary effect on just the currently active window but the human effort is limited to slight movements of the pinkie of one hand and the index finger of the other hand. One hand holds down the Control Key while the other hand rotates the scroll wheel on the mouse. Try it now if you have a scroll wheel on the mouse. It works on most programs. This scroll method also works well for me when I am using my mobile netbook. With a ten inch screen, that’s ten wide and only about five or six high, sometimes there is not a whole lot of a map site, email inbox, or even an entire Word document visible at once. A quick flick of the Ctrl + scrollwheel maneuver and I can view the full page and then zip back in to text reading mode. 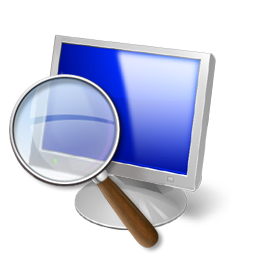 To actually magnify part of the screen in Vista: Open Magnifier by clicking the Start button, click All Programs, click Accessories, click Ease of Access, and then click Magnifier. Move the pointer to the part of the screen that you want to magnify. Using Windows 7 with the fancy Aero desktop thing running you have more options: Same Start menu path as in Vista. For an easy way in either operating system press the funny flag key that is the Windows Logo key and type Magnifier in the search bar right above the Start button. Full-screen mode. In full-screen mode, your entire screen is magnified. Depending on the size of your screen and the zoom level you choose, you might not be able to see all of the screen at the same time. Lens mode. In lens mode, the area around the mouse pointer is magnified. When you move the mouse pointer, the area of the screen that’s magnified moves along with it. Docked mode. In docked mode, only a portion of the screen is magnified, leaving the rest of your desktop unchanged. You can then control which area of the screen is magnified. To exit Magnifier, press the Windows logo key + Esc. This next method I am only telling you about to then tell you not to use it. I used to like it. Liked it long time. I still like it for CRT monitors. Those are the monitors that had glass screens you could punch when needed, were more three dimensional than the flat screens, tolerated Windex or worse, and had a stable punch taking heft to them. Even with CRT’s if you changed the resolution drastically you would have chunks of your desktop fall off the face and then have to learn how to adjust the screen width and height with those buttons somewhere on the monitor itself. I liked that part too. But with the LCD being most popular now, and not visually appreciative of resolutions changes, it is best to avoid any selection but the recommended optimum leave it alone setting they all find automatically. Especially with wide-screen laptops. It’s easy to get your 4:3, 16:9, zoom, custom, etc. all confused. Simply put, things get blurry, stretched out, washed out, and then put back the way they were after some wasted time. So, forget the resolution and move on to the next one please. Actually we can still play in resolution park without getting into trouble. To make the text and icons larger, while preserving the optimum screen resolution we can adjust the DPI, or dots per inch. Never mind how many dots, not important, we deal in percentages for this one. Open Screen Resolution by clicking the Start Button, click Control Panel, and then, under Appearance and Personalization, click Adjust Screen Resolution. Smaller – 100% (default). This keeps text and other items at normal size. Medium – 125%. This sets text and other items to 125% of normal size. Larger – 150%. This sets text and other items to 150% of normal size. This option appears only if your monitor supports a resolution of at least 1200 x 900 pixels. If it’s just the icon sizing on the desktop that is bugging you. That is easily modified. I personally like the desktop icons small if at all. I like a neat desktop. Okay I would like a neat desktop. The reality is that I now have at least three dozen icons so they have to be small to allow separation. I started putting just the really important shortcuts (website links to get back to later) right on the desktop because my internet favorites/bookmark folder was really a mess. But in theory and in memory I like a desktop free of icons. Maybe you do too. However, if your monitor is going fuzzy like mine was, you may want those icons larger instead of smaller. Right-click the desktop, point to View, and then click Large Icons, Medium Icons, or Classic Icons (classic icons are the smallest). You can also use the scroll wheel on your mouse to change the size of your desktop icons. Don’t forget my favorite zoom device. 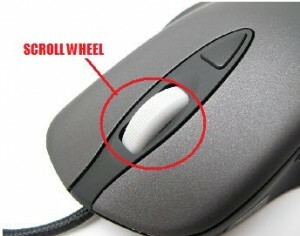 The scroll wheel on the mouse. Find an empty place on the desktop and press Ctrl while you scroll up or down. A nice internet specific tactic is to use the View drop-down tab at the top of the page next to File and Edit. Each browser has a zoom feature in the View menu. Chrome has the zoom percentage in the settings menu signified by a gear image in the right corner. In Internet Explorer the menu has several selectable zoom percentage choices which alternatively can be controlled using Control plus the + or – key. Right below Zoom in the View menu is a Text selection button that adjusts the text but leaves the rest of the website images, title bars, ads, and buttons alone. This is nice. Firefox likewise has adjustments (Ctrl + or – ) for total zoom and text-only size adjustments. Same nice. Bottom line is that you have to get in there and mess with settings. With almost infinite customization available you don’t need to settle. Have some fun with different looks and make the screen a comfortable place to spend so much of your time. 1. The key is to play with settings in Windows and within various programs to help you see things better and avoid eye strain without admitting the need for glasses. 2. Tell people to call me so I can fix their machines and make money. This entry was posted in Do It Yourself and tagged Ease of Use, Magnify, Tweaks by Steve. Bookmark the permalink. I’m going to bookmark you so i will be able to read your new articles whenever i want. thanks for helping.